Sir Philip Mitchell exemplified all that was best in a long and distinguished tradition. Mr. Frost demonstrates this clearly in this well-documented book, but Mitchell's formative years, the first thirty-five, are given only eleven pages of text out of 276. A bibliography would also have been helpful. Mitchell was born in 1890. His childhood was tragic. His mother died when he was two; his father was dour and aloof. Lack of parental guidance left him aimless. He was sent down from Oxford for youthful pranks, but found his true vocation in the Colonial Service. No diaries have survived before 1927, so evidence may be lacking about his life as a district officer in Nyasaland before the War. In 1914 Mitchell enlisted with the King's African Rifles. We are not told that he won the Military Cross, possibly for his conduct in an action in 1916 in Mkapira, on the Ruhuje River, between Lupembe and Muhange, north-east of Lake Malawi. He led one of four companies of 1 KAR, who together with the Rhodesians defeated a German force under Major Kraut.' Mr. 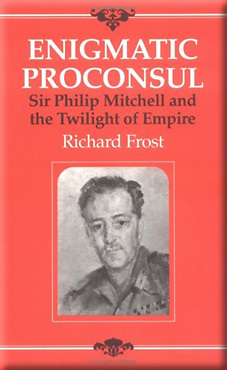 Frost explains in detail how the courage and faithfulness of African servicemen convinced Mitchell that white men had no claim to superiority. War imposed equality on all. Officers, soldiers, and porters shared the same dangers and hardships. After the War Mitchell transferred to Tanganyika. In 1925 the dynamic new governor, Sir Donald Cameron, made him Assistant Secretary for Native Affairs, succeeding Charles Dundas as Secretary in 1929. The ultimate aim of Cameron's reforms under the Mandate - legislative council and indirect rule - was self-government. The years 1925 to 1940 were undoubtedly the most satisfying of Mitchell's career; in 1935 he became Governor of Uganda. He was at the height of his intellectual and physical powers, able both to do work at the centre of power, and to visit officers in the field. Perhaps his outstanding contribution to the future of East Africa was to found two future universities: Makerere, and after the War the Royal Technical College, Nairobi. During the War Mitchell held high political office in the Middle East and the South-West Pacific, where he was also Governor of Fiji (1942 to 1944). He got on well with his service chiefs Field-Marshall Waved and Admiral Nimitz. All Mitchell's diplomatic skill was needed to persuade Haile Selassie that winning the War was the goal, towards which the liberation of Ethiopia was incidental. The uncritical attitude of the Foreign Office and its Minister in Addis Ababa, Robert Howe, towards the Emperor made this task harder. (On pages 136 to 139 Howe is confused with Mitchell's Uganda colleague Ralph Hone [sic]. Also, on page 253 Kenyatta was defended by D. N. Pritt, not D. A. Pratt). Mitchell's relations with Haile Selassie bore some resemblance to those with the Kabaka of Buganda. In the Pacific a war had to be won, good relations created between Americans, Australians and New Zealanders, and a colony governed. Mitchell knew from Uganda experience how risky a single-crop economy was; Fiji relied on sugar, and the growers were on strike for better prices. Race relations, however, were a minor problem compared to what he would have to face in Kenya. Mitchell reluctantly became Governor of Kenya in 1944. He was exhausted and talked of retirement. A dynamic popular movement under Jomo Kenyatta demanded reform, but Mitchell was given no more power to overcome hardline settler opposition than his predecessors had enjoyed. He was not well enough to visit the districts and hear what was happening. The intelligence system was uncoordinated. It is still felt very strongly that he was unpardonably complacent about the growing unrest among the Kikuyu, especially the squatters on European farms. Though Mitchell bears a heavy burden of blame for the outbreak of Mau Mau, his political masters in London share the responsibility; they kept an ailing governor in office for eight years when a younger and more vigorous man was badly needed. Perhaps there is little to say about Mitchell's private life. His wife was not a very impressive person, and they had no children.^ Mitchell was a very good-looking man, notable for his warmth and humanity, of which Mr. Frost gives examples. He was sympathetic about other people's troubles, and was not afraid to show his emotions. It is a tragic irony that this high-minded, brilliant and dedicated public servant failed to see the awful dangers towards which Kenya was heading as his career ended. All who are interested in East African history will be grateful to Mr. Frost for showing us how distinguished that career was.